The announcement I have been waiting for !!!!! The first Russian releases for DUST Tactics/Warfare have been announced! Now on first blush I am not so sure about the design of the copter - it looks too bulbous/too much like a toy for my tastes. That being said I am sure there will be lots of ways to edit it to make it look cooler and what is most important about its inclusion in this picture is that it means AIRCRAFT are finally going to be a part of the game! 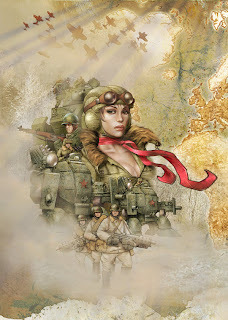 Also one of the figures is clearly the character Koshka (one of the main protagonists of the comic and the girl seen in most of the web art, cover of the box for the boardgame etc.) which is pretty neat! 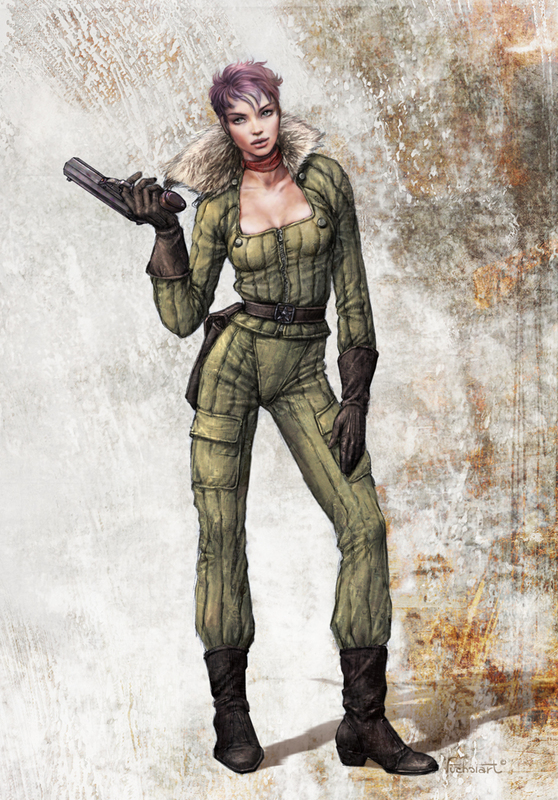 Also pictured is a medic (more rules) and what appears to be a model holding a Molotow "cocktail". A little stereotypical but neat nonetheless. It is worth noting that in the world of DUST, the Sino-Soviet Union is very much the key protagonist group in the battle against the Axis. The Allies are barely clinging to Britain and are mile behind everyone else in their mobilization for war. The SSU on the other hand has held in the face of Axis offence and has done a much better job of field stripping and capturing Axis tech for reuse and reverse engineering. 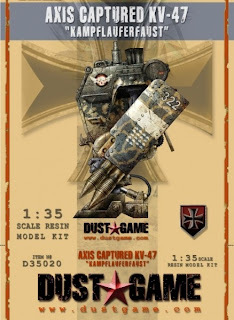 Their 'bots seem to trend towards small quickly built battlesuits like the KV 47 or extra big behemoths like "Big Joseph" (man I hope they make that in 1:48 - I still want to build a 1:35 one pretty bad! 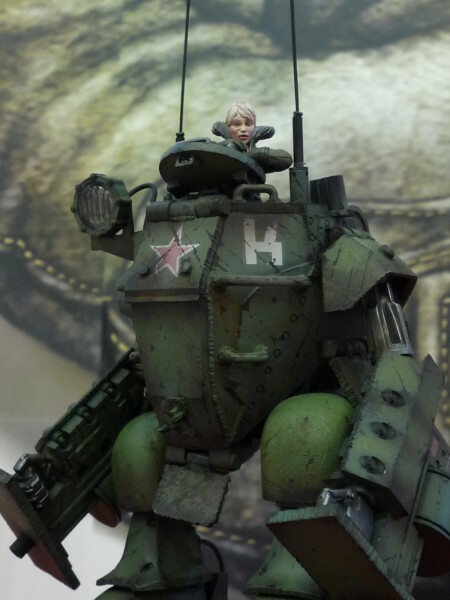 Google Jose Brito's one if you want to see an amazing piece of modelling!). It also paves the way for players to convert (or the company to produce) DUST48 scale axis captured and refitted "Kampflauferfaust" which should add a different dynamic to the Axis forces. 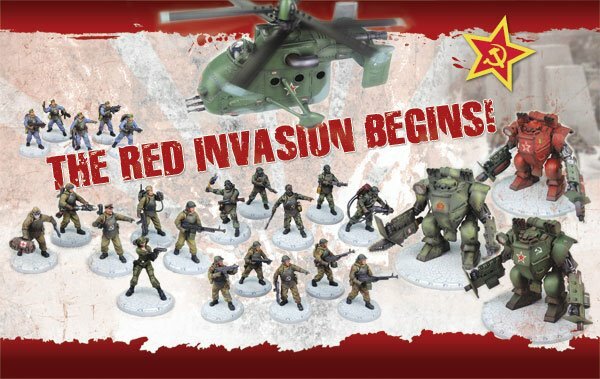 For a couple of years now I have horded a few AT43 Red Blok (Russians) in anticipation of this direction in the game so I now have some pretty cool alternate troops and robots to make use of! I really look forward to playing and painting these guys up. Fantastic work by the way, I really admire your painting!! !